Parts and accessories for 1930s cars. Homepage. 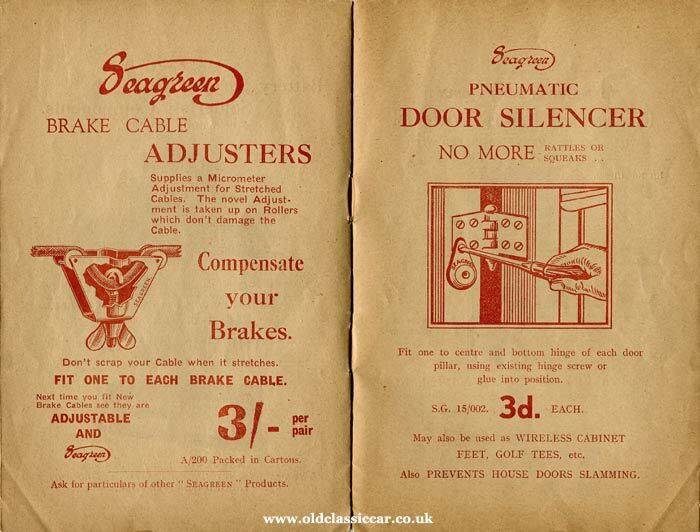 This page: A pre-war motor spares catalogue. Seagreen - for car parts. A small number of car parts and accessory suppliers that were in business prior to WW2, are around to this day, Halfords being perhaps the best known in Britain at least. 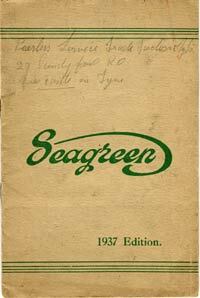 Here though is a catalogue for a more obscure concern, Seagreen. Nowhere in this slim publication is information given as to who, or what, Seagreen actually was. Was it a company in its own right, producing these car parts, or was it simply a brand name that belonged to a larger company? There are few real clues to be found. There's a gummed label stuck to the first page, for a company by the name of Chillcotts Limited, of 1-4 Trinity Place in London SE1. Whether this was the parent company for the Seagreen brand, I'm not sure. Without trying to peel the label from the page, I'll never know whether there's a different company's name and address beneath the stuck-on label. Handwritten in pencil on the front cover, is an address that reads: "Peerless Service Truck Factors ???? ?, 22 Sandyford Road, Newcastle Upon Tyne". Pipe connectors and windscreen wiper tubing. The first couple of pages are shown below, beginning with the Seagreen flexible petrol pipe connectors, along with connectors for oil pipes, and a large service kit containing a variety of sizes. 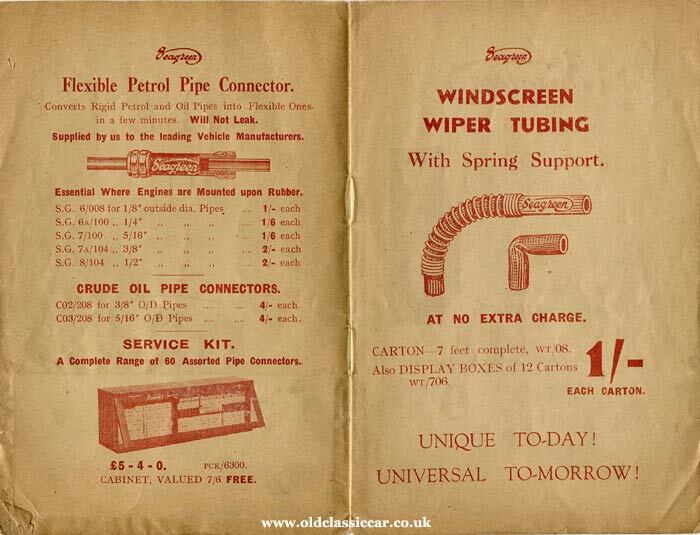 The wiper tubing (with spring support) was on sale for one shilling (5 pence) per carton of 7ft's worth. Handy stuff, for any motorist saddled with the joys of vacuum-operated wipers. It's likely that this catalogue was aimed more at the trade buyer, rather than Joe Public and his lone Standard 8, Austin Ruby, Ford Model Y or similar. Hose clips, and brake cables. 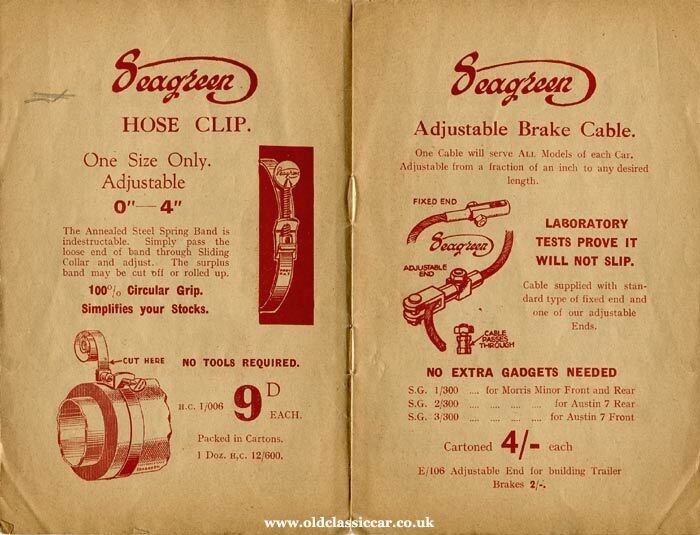 There then follows an advertisement for the Seagreen "one size fits all" coolant hose clip, with its "indestructable" annealed steel spring band. The idea was you'd fit it to the hose, then trim off the excess. Fine in principle, but not much use if you ever hoped to re-use the clip somewhere else. Plus it relied on finger strength to tighten it up fully - unless you could get a slim pair of pliers in to finish the job. Opposite are details of the company's adjustable brake cable, quite a neat idea but one that didn't take off. Battery terminals, cables, & braided earth straps. Everything that sir or madam required for their car's battery is described next, beginning with the solderless battery terminals. A selection of braided cables and earth straps could also be ordered for a moderate sum. The Seagreen Ignition Tester did exactly what it says in the catalogue. Apparently it could pinpoint problems with the distributor cap, coil, spark plugs, rotor arm, contact points, condenser, and associated wiring. Very handy. It's recommended to garage owners, to "Convince your Customers that you know your job". 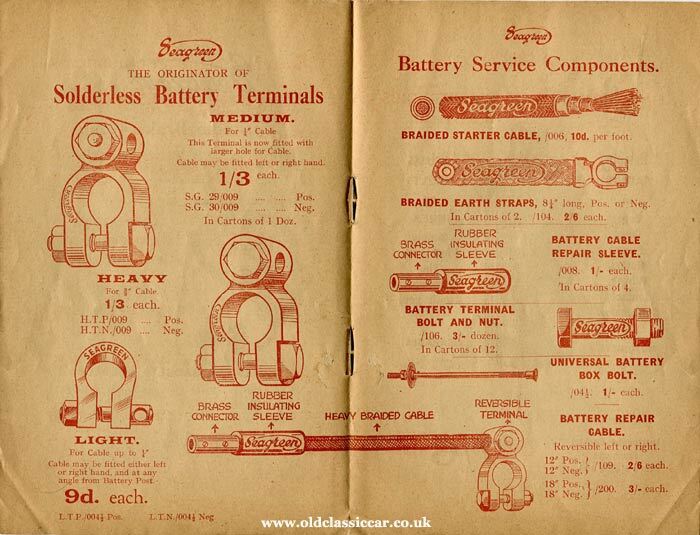 On the facing page, is offered a battery overhaul kit supplied in a steel tool chest. A junior kit, supplied in an oak cabinet, was also available. Those were the days, when steel or oak was used for containers, instead of cheap plastic or cardboard boxes. Cable adjusters, and door silencers. Two very different products are described next. First, a brake cable adjuster, designed to take up slack in an older cable. I remember trying one of these on my Triumph Spitfire's handbrake cable, in the early 1990s, however shortly afterwards such adjusters became an MOT failure point. On the opposite page, the Pneumatic Door Silencer. This was designed to lessen the irritation of rattling doors, the rubber (?) buffer wedging itself between the door pillar and the door when closed, to lessen the chances of squeaks and rattles. 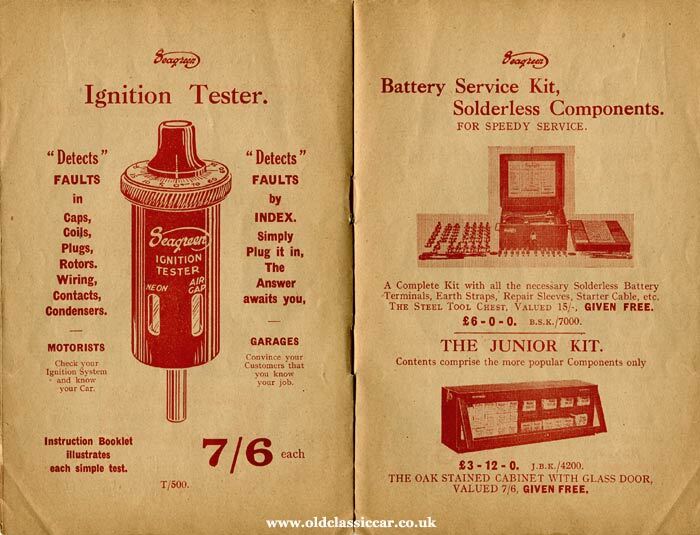 I wonder if any of these are still in service, on a pre-war car somewhere? Other suggested applications include use as feet for a wireless cabinet in the home, and as a golf tee (!). 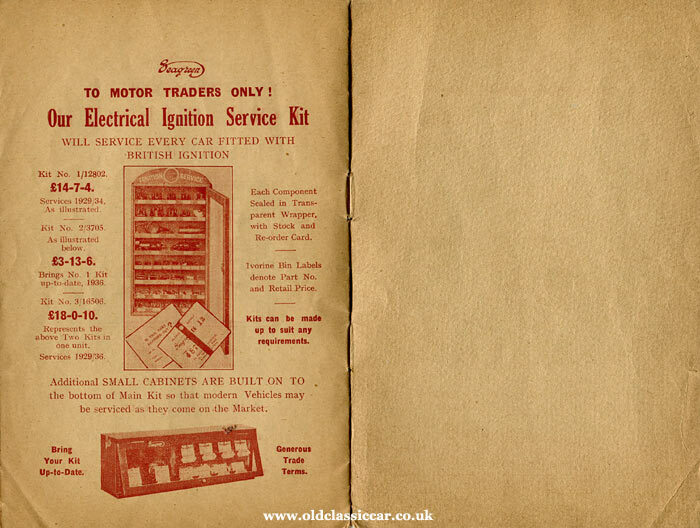 The final page is given over to the Seagreen Electrical Ignition Service Kit, an impressive-looking wall-mounted cabinet in which all manner of branded products could be stored. Smaller, add-on, cabinets could be attached to the bottom of the main item, to accommodate parts for newer cars as they came onto the market. But what became of Seagreen? They were on sale during the 1930s, as this catalogue from 1937 proves, but did they survive into the post-war era? And if so, did they go out of business, or were they swallowed up by a larger concern, such as Lucas perhaps? Many car accessories and gadgets can be found on the site, including details of similar catalogues to this. They include one for Marble Arch Motor Supplies, dating to the 1950s, and aimed more at the motorcycle and cycling markets, another for Terrys, from a similar era to the Seagreen publication featured above.